The owners of Around the World Burgers have explored the world, old and new, in search of the greatest burgers known to mankind. 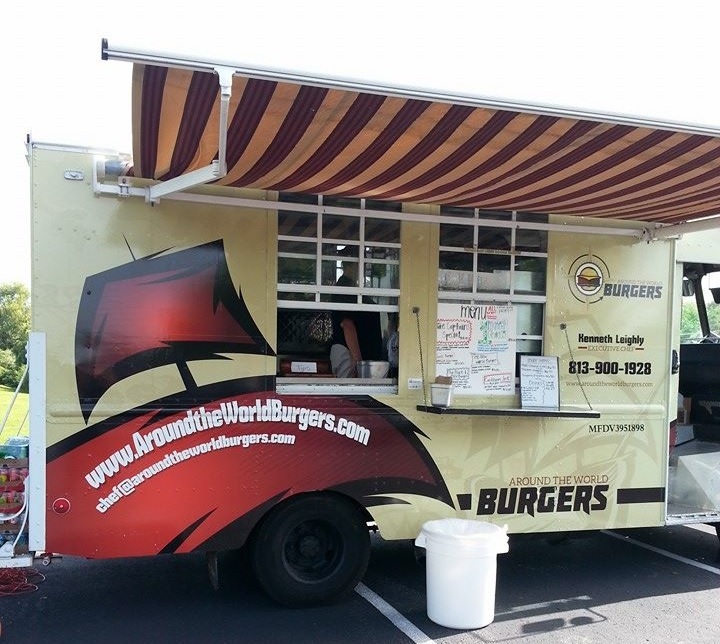 The menu for this local Tampa food truck contains gourmet burgers inspired by their travels and cuisines from "around the world." Captain’s Special - Sweet Rum BBQ Sauce, Applewood smoked bacon, lettuce, tomato and cheddar cheese. First Mate’s Choice - Pepperjack cheese, sliced Jalapenos, lettuce, tomato and Applewood smoked bacon. New World - Basic burger with lettuce, tomato, pickle, onion and cheddar cheese. Mushroom and Swiss Burger- Sauteed mushrooms and Swiss cheese. The Goat- Herb infused Goat Cheese, tomatoes and Applewood smoked bacon with mango chutney sauce. Sriracha Burger- Swiss cheese and Sriracha Ranch sauce. Plain Burger- Nothing on it! Veggie Burger- A veggie burger patty with lettuce and tomato.